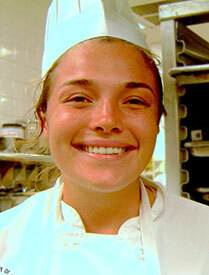 Kuuleinani Breen is a student in the Culinary Arts Program at Kauai Community College. A Native Hawaiian, Breen was a Waialeale Project student, which supports all expenses for students whom a college education is a stretch goal. She has excelled at Kauai CC and has earned a place on the dean’s list three times and is also a member of Phi Theta Kappa Honor Society. Breen has put in many hours as a volunteer for community events such as The Taste of Kauai, the Rotary Club’s annual fund scholarship fundraiser, and the college’s American Culinary Federation Breakfast and Spring Gourmet Gala fundraiser. Breen has earned the respect of faculty members and peers showing perseverance and diligence as a leader in her cohort group. One of her greatest contributions has been as a role model. She has applied strengths taught in the culinary arts pathway—the ability to manage time, communicate effectively and successfully, positively direct others to complete tasks, give full attention as a listener, create new and inventive products and help student colleagues. She looks forward to beginning her career in the food service business and serving as a community leader. Breen’s goal is to one day have her own restaurant. The Masaki and Momoe Kunimoto Memorial Award for Outstanding Contributions to Vocational Education rewards outstanding achievement and significant contribution to vocational and technical education by a community college faculty member or student. The award was established by family members to honor the namesakes’ role in development of the food industry in Hawaii.